For me, every trip to Taipei should start and end at Din Tai Fung. From the minute in we land in Taoyuan airport at 6am, I start counting down the minutes until they open at 11am so that I can finally be reunited with a steamer of xiaolongbao. When it comes time to return to LA, I'm so sad to be leaving those steaming little buns of porky goodness that I have to visit one more time before my flight and take some to go for the plane ride. 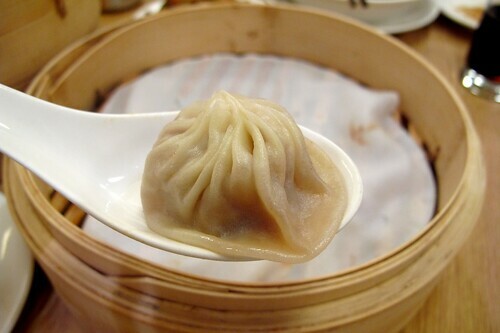 I absolutely refuse to argue with anyone about where to find the best xiaolongbao. There is no argument to be had. Din Tai Fung wins hands down. 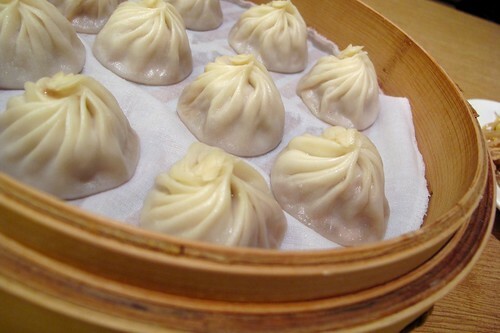 If Din Tai Fung doesn't make you proud to be Taiwanese, I don't know what would (Taipei 101? Chien-Ming Wang?) It was named one of the top 10 gourment restaurants in the world by The New York Times in 1993. All I know is, Din Tai Fung is not only synonymous with delectable juicy, perfect specimens of xiaolongbao, but also simply, Taiwan. 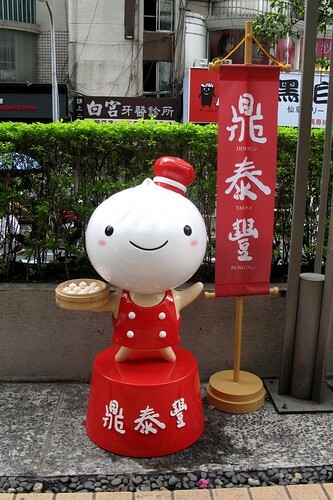 There are now a total of four branches of Din Tai Fung within Taipei--my favorite still being the Zhongxiao branch. The original Xinyi branch definitely has a more authentic atmosphere (and even MORE tourists) but lacks the cleaniness and efficiency of the newer branches. The two newest branches, located inside Sogo department stores, are just a good but lack a certain charm so I've only visited each one once. I've lost count of how many times I've been to the Zhongxiao branch. Maybe I keep returning to that one because I'm just sentimental, but all I know is, I've NEVER been disappointed there. Just keep in mind, if you get there any time after 1130 am on ANY day of the week, expect to see monstrously long lines consisting of Japanese tourists, and locals who know good food and are smart enough to know that the lines are worth braving. We always go right when they open in the mornings. It is the perfect late breakfast/early lunch feast. 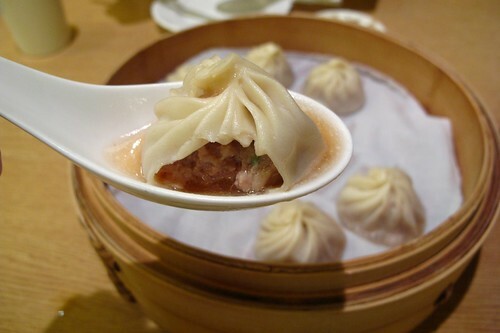 Consistency, service, and cleanliness are words that come to mind when Din Tai Fung is mentioned. The service in Din Tai Fung is always without fault. The servers are so expertly trained and so professional it seems superhuman. Cleanliness is always impeccable. For the flow of customers they accommodate every day, the restaurant is still in perfect condition. You will never find a dirty plate or a sticky table here, and if you did, a server will be there in the blink of an eye with a new plate or clean white towel to wipe the table. There is always an attendant in the bathrooms that goes in after every customer to make sure everything is clean for the next customer. The kitchen is show in itself. Enclosed in large see-through windows, you can watch as men in white uniforms and face masks make deliciously perfect little xiaolongbaos at lightning speed. It's amazing that they can crank out enough of them to satisfy everyone in the restaurant. Once you place your order, everything comes out in perfect timing. Everything in the restaurant runs like clockwork, with the kitchen and the servers always in sync. I guess the service of the restaurant has to do the food justice. While Din Tai Fung serves up the best xiaolongbaos known to mankind, everything else on their menu is also worthy of recognition. Although their niu rou mien might not be put up on a pedestal any time soon, there is absolutely nothing wrong with it. Just like a lot of their other dishes, it's delicious--you just don't have room in your stomach for a steamer-full of xiaolongbao AND a bowl of filling noodles. 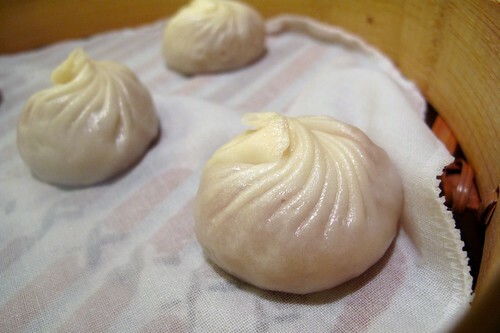 This is the only flaw I can find in Din Tai Fung--too much yummy stuff! This is the beautiful new menu they just introduced the last time I was there. 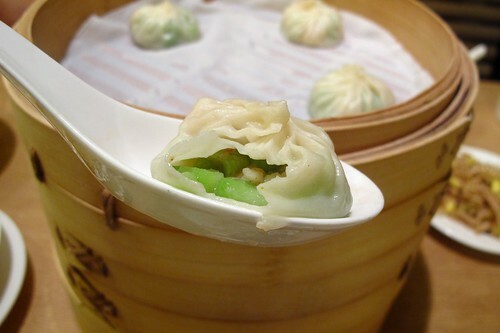 I should mention that all the xiaolongbaos and dumplings can be ordered as half-orders and the soups can be ordered as small, medium, or large. This allows you to try more than one flavor without getting too full. 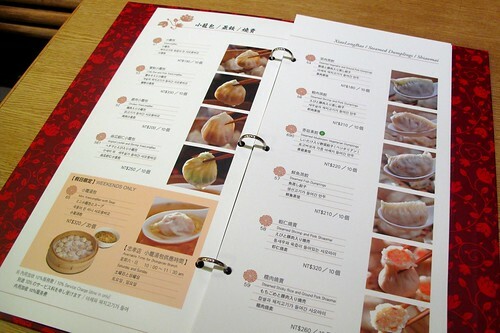 Of course, do yourself a favor and order the full order of traditional xiaolongbao. They will all be gone before you know it--just be careful not to burn yourself on the piping hot soup inside! I don't even know where to begin. There really are no words worthy enough of describing it. You just have to pop one in your mouth and smile in pleasure as the soup inside fills your mouth when you chew through the thin skin and into the juicy pork--that says it all. Sometimes a dip in ginger and black vinegar is also great. However, I'll take one plain any day. I think they're literally happiness in perfect little bundles. 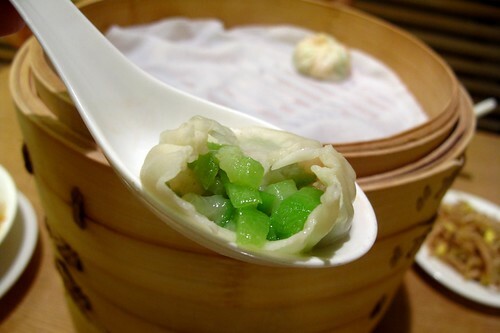 These also have that perfect thin skin that traps a lovely sweet liquid inside, but they contain loofah--a thoroughly Asian vegetable that I adore. This was my first time ordering these and they were pretty delicious. I love how the vegetable was cut into perfect little pieces. 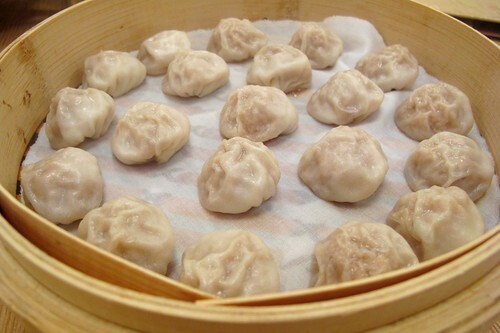 Every time I eat one of these dumplings I marvel at how they manage to get the skin so thin and perfect on every one. It really is amazing. For whatever reason, these are only available Saturday Sunday 10:00am-11:30am and are a little more expensive. Maybe because they're smaller, they're harder to make? 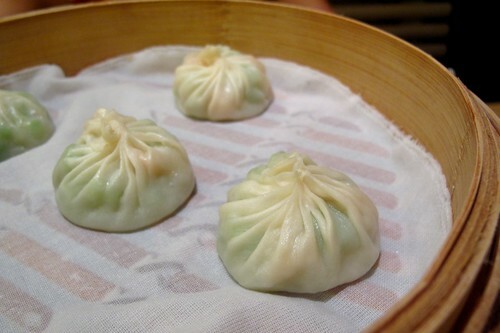 All I know is, these are even better than the xiaolongbao!!! Is that possible?! I think I just like them so much more because their size is the perfect mouthful. 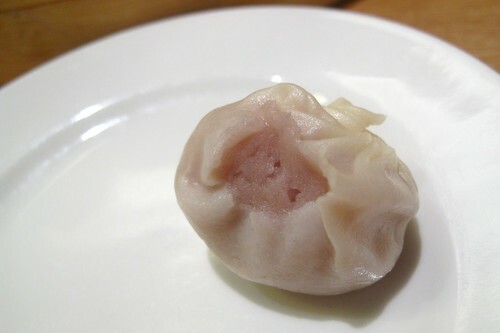 Sometimes the xiaolongbao is too big for one mouthful and that leads to an awkward bite which then leads to soup spillage. In this case, everything is contained in one bite. The soup that it comes with also adds another lovely option. 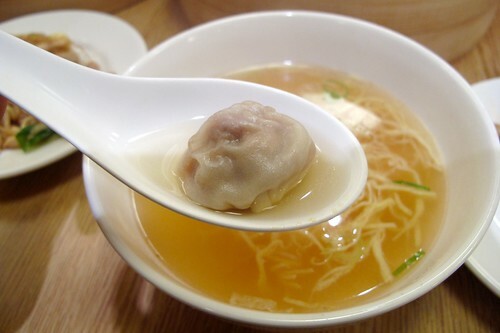 Sometimes, I eat them with a spoonful of soup--increasing the liquid-factor of the dumpling. 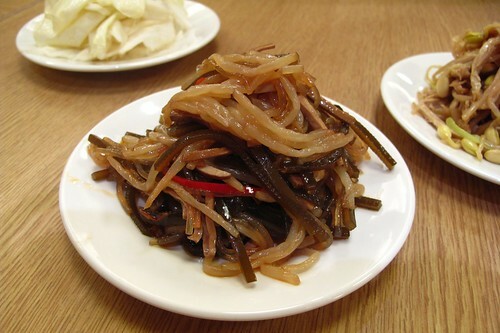 This contains glass noodles, seaweed, bean curd, and bean sprouts mixed together with soy sauce, sesame seed oil, chili peppers, green onions, and who knows what else. It's delicious and we order it every time...almost subconsciously. This was a new addition to their menu and I actually enjoyed it a lot. 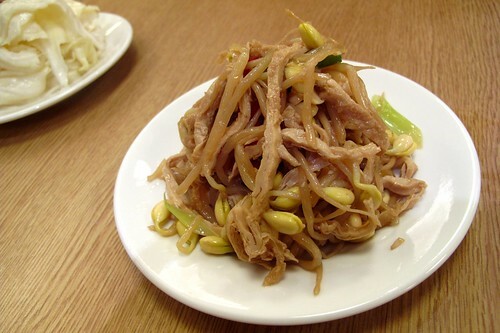 I loved the texture of the soy sprout--they were like bean sprouts with an edamame attached to them. This is another dish that we always order. 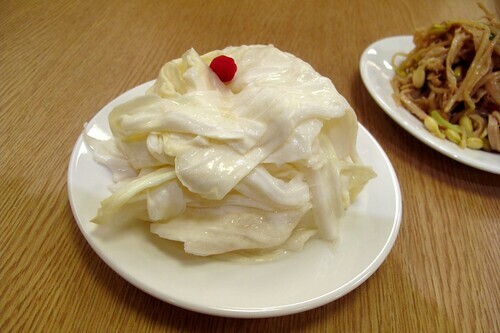 Sometimes I like eating a piece of cabbage with a xiaolongbao. It cuts back the richness of the pork a little bit. The noodles at Din Tai Fung are also spectacular. 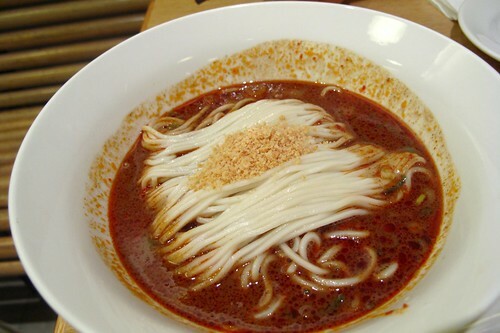 Delicious chewy strands of freshly made noodles in all kinds of different broths! I have to say, the noodles are sometimes under-appreciated just because there 's so much more going on in the menu and noodles are filling. In any other circumstance, people would be absolutely raving about the quality of Din Tai Fung noodles. My favorite is this one because it comes in a spicy, yet nutty sauce that is just amazing. So good. 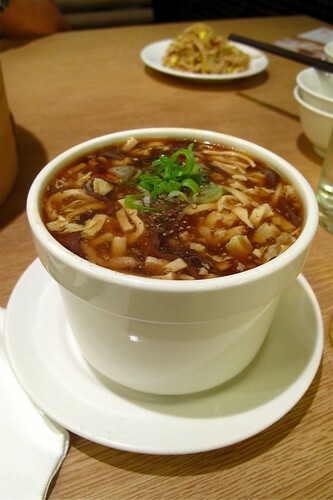 The hot-and-sour soup at Din Tai Fung is also the best I have tasted anywhere. I love finding the little strands of pig's/duck's blood in there with the bamboo shoots and tofu. It's perfectly sour--not too much and just enough. Also incredibly good but I can usually one eat a few of these. By the time these come along, I'm too full already! 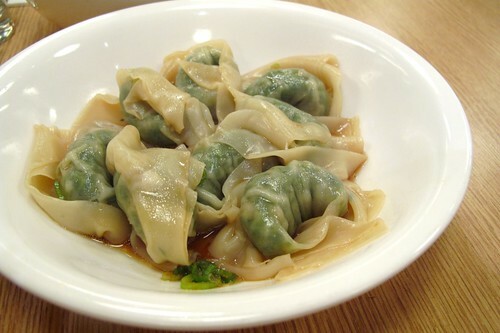 The skin on the wonton is perfectly chewy and the sauce is kind of like a sweeter soy sauce. However, these are probably my brother's favorite. 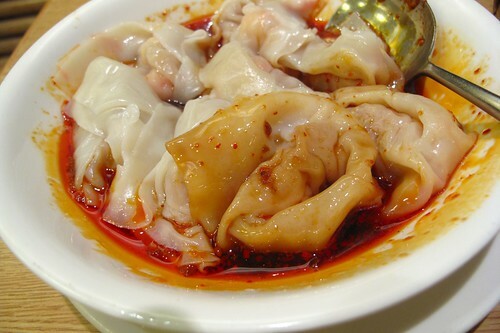 Even better than the previous wontons because they come in a delicious spicy sauce. Sweet and spicy and salty--it just makes you want to eat more and more of it even though sweat starts beading up on your nose. Even though I'm usually already bursting at the seams by the time dessert comes along, I can never resist it. This is when the half-orders start coming in handy. I love the taro paste inside these dumplings. The skin is just as thin as the ones on the xiaolongbao and the filling is this delicious, creamy, buttery, subtle paste of taro root. I love taro desserts and this one is probably one of my favorites. 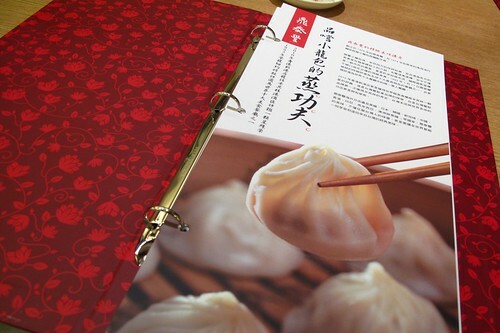 Ba Bao Fan is usually not very exciting but at Din Tai Fung, it is done wonderfully. I can't identify everything that bejewels the top of this colorful dessert (anywhere else I would find extremely colorful things questionable) but just trust me when I say it's even better to eat than to look at. 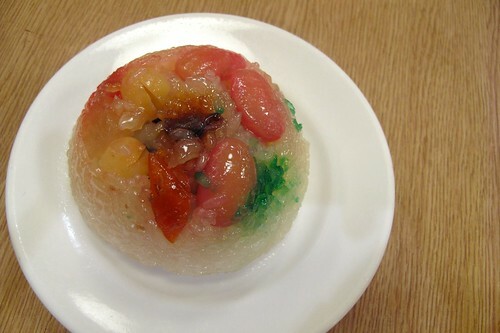 Inside the sticky rice is a red bean paste that I'm pretty sure is flavored with lard. Yes, lard. And it taste all the more amazing because of it. !!! I want those mini XLBs! More than improve--I don't think it gets any better! yum! i haven't had the mini xlb before.. i'm not brave enough to fight the weekend crowds i suppose. zhongxiao is my usual go-to ding tai fung as well! great post! You're right. The food is great. It's simple, not too rich, not too much ginger, etc. The Chungshiao branch is near my office, so I sometimes go there. There's a good stretch of restaurants on that same block. Yuma is practically next door; then right around the corner is Mary's, Alley Cats and Toasteria. But... "Consistency, service, and cleanliness are words that come to mind when Din Tai Fung is mentioned." Don't you sometimes think they're churning you in and out as fast as possible? For example, I went there with a reservation and still had to wait in line. Then the waitress tried to take our order while we were in line. We refused of course saying we'd place an order from our table, whenever that came. Many people in Taiwan seem to be attracted to restaurants with big lineups. They think it's the sign of a good restaurant. Maybe so. I just like my elbow room and eating at a leisurely pace a bit more. I've only been to the Ding Tai Fung in Arcadia and after going back time and time the Xiao Long Bao just doesn't really seem to stack up. Perhaps it is because they seems too generic in my opinion with every piece tasting identical to the last. Are they made by robots or by human beings? Maybe it's the love that is missing in every bite. Anyways, amazing write up that will get anybody to try it after reading this. I know any branch outside of Taiwan can't compare to the originals thus this is on top of my to do list for my trip to Taiwan this summer. @joan: We always go during the weekend just so we can have the mini xlb...as long as you go before 11 am there usually isn't any line at all. And even if there is a little line, it's so worth it :) You're so lucky you're so close to it! @Patrick: Aahh you're lucky you're close to it too! haha and I'm sorry you feel rushed when you dine there. I rarely have that kind of experience but again, that might be because I usually go right when they open, before all the crazy touristy crowds. I have experienced the waitresses taking orders while still being in line but I guess they assume that since you've been waiting in the line for so long, you'd like your food to be ready the minute you sit down. 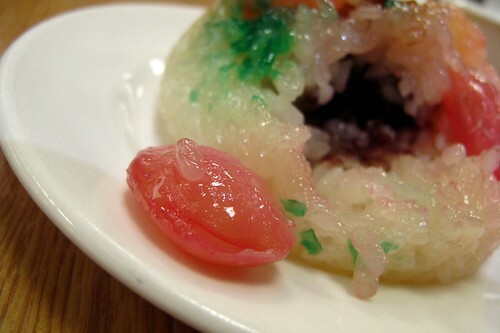 Oh my, I didn't know they had so many different items in the Taipei one—the loofah dumplings are gorgeous! Whenever I go to visit Taipei, the first stop is always Din Tai Fung. My relatives are so great, taking us there and patiently waiting with us, sometimes an hour or more. Your pictures are so beautiful. I've never had the treasure rice at Din Tai Fung. I love the colors! Nice writeup! I'd probably go for the loofah and shrimp dumplings next time when I'm back.